We'rrrrrre BACK!!!! 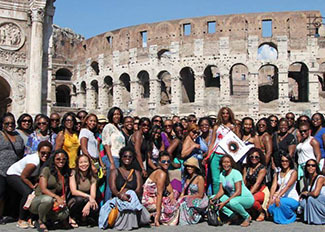 Italy did not know what hit it when 47 beautiful and exciting Black women from all over the United States landed for 10 days of NON-STOP FUN on BlackGirlTravel.com's Bella Italia 2014 tour. There was so much going on that we only averaged about 3 - 4 hours of sleep per-night the first 3 days because that is how we do at BGT (BlackGirlTravel.com). SLEEP ... ain't nobody got time for that! Check out the video below and see what all the talk is about and why you should. join our family. See you in 2015! Remember to book early. Our tours sell out fast. No Hype! Black Women... Beautiful! This is Who you Are. This is How We Roll in Rome, 47 Strong. Zoom! Zoom! Let's Stay Together... Cooking Class! Blacks walks into the hotel bar sees 47 Black women. Jasmine L. : This was truly a great experience. I met a lot of great women and look forward to building lasting friendships. Thanks so much Fleace for the vision! Stephanie S. : Words can't express how grateful I am for this experience and for the many wonderful women I have met. I had the trip of a lifetime and Fleace, I appreciate all the hard work, all the sweat, and all the tears to make Bella Italla something I will never forget! 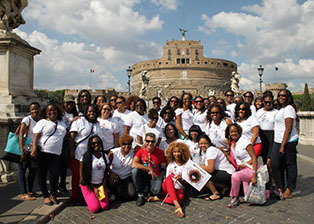 Pamela P. : It's hard to put into words what my Bella Italia trip with BlackGirlTravel.com means to me… It was truly the time of my life! From the Segway tour to riding the streets of Rome on Vespas, each day brought new experiences and new memories! There were so many highlights, but I think two things stand out: the chair lift at Capri was truly a spiritual experience, 24 minutes of such peace and beauty, all I could do was give thanks to God for this awesome opportunity. 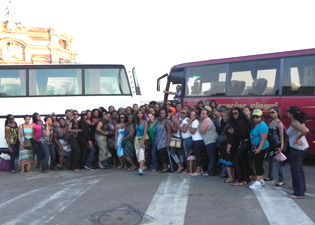 And the real intangible benefit was the wonderful women that I bonded with during the trip. We laughed and cried as we shared our lives. I have truly made new sister-friends that will last a lifetime. Fleace you truly have a mission, I truly feel empowered to do more international travel, and I thank you for following your passion. This will not be my last tour with you, God willing! DrMonifa J. : What an amazing experience! 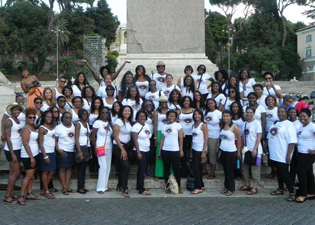 Shannon P. : This trip was a highlight for me and to share my experiences with 60+ black women was awesome! I know this tour of Italy will be the most memorable. Kathlene H: I just wanted to thank you for allowing me to travel with you. I totally fell in love with Italy and I own it all to you. I can only imagine the how much and planning goes into this year after year. Tamaya W. : Fleace, your tours sparks a flame inside women. It has done that for me. I want more! Ollie G. : Bella Italia was an experience of a lifetime . My venture with BlackGirlTravel was the best recommendation I could have ever received and supported. This tour is a must! Gina P : Wow, what an AMAZING journey through Italy. I have been to Europe four times and sometimes solo....no more solo trips for me. I met Sistas that are positive, dynamic and exciting to travel with. This was by far my best trip to Europe. 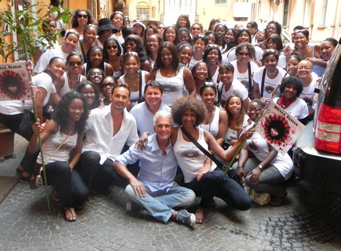 We explored history, ate good food, enjoyed fine wine, dance the nights away and the wonderful Italian men...Ahhhhh. Oh yes, planning to travel the world with my Sistas. Keisha M. : Words cannot express how this trip....has officially scarred me for life! Now all I want to do is travel, and maybe exclusively in Italy! I am truly blessed to have visited a place which I had only dreamed about! And the type of women I have met...truly the cost cannot equate to the valuable friendships I made. I'm coming back Italy! on Bella Italia 2015 and other tour.